You don't realize just how good a gaming year it's been until you look back at all of the games you actually played. From physics puzzlers to ninja simulators, 2012's library was full of interesting, creative, unique experiences. My personal game of the year, Virtue's Last Reward kept me up for many hours, many nights in a row. Though some—like Kotaku boss Stephen Totilo—have found the game's opaque puzzles and overwrought dialogue to be rather tedious, I enjoyed every moment of Aksys's chilling visual novel. A wonderfully well-written role-playing game with pleasant British voice acting and combat that taught me how to enjoy running around and smashing the A button, The Last Story (not to be confused with Hironobu Sakaguchi's other work, Final Fantasy) is the year's best JRPG—if not the generation's. I've written a lot about how Dishonored is a stellar experience, but really, all that matters is the Blink spell. There are few abilities in a video game as satisfying, as empowering, as totally game-breaking as an ability that you can use to teleport anywhere at any time. The world and art direction are just dismally gorgeous icing on the delicious Blink cake. Let me sum up my feelings toward Persona 4 with an anecdote. A few nights ago, I was fighting one of the game's final bosses. After a solid 45 minutes of battling, I had taken him down to something like 10% health. I was following the same patterns: buff, attack, heal, rinse, repeat. I was ready for it to be over. He uses one attack. Bam. My main character instantly dies. Game over. Time to start again. 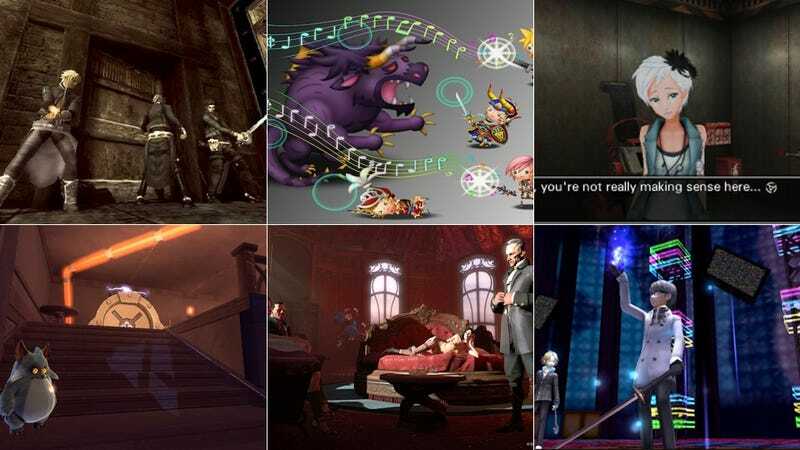 Rhythm games are fun, Final Fantasy music is fantastic, and there's something really special about a game that combines the two. Even when you're repeating the same songs ad infinitum, it's hard not to love the addictive, frenetic tapping of Theatrhythm. The name, on the other hand, is very easy not to love. I enjoyed every minute of this first-person puzzler, wonky physics aside. I wish the ending had been more satisfying, but the journey was totally worth it. Funny that the year's best Diablo game wasn't even called Diablo. Forget the snappy controls and smart interface; the best part of Mark of the Ninja is that every stage feels like a puzzle with multiple solutions. Would you like to choke out that guard from behind or throw a smoke bomb so you can get past him without being seen? Ninja is a smart, tight, remarkably enjoyable game. It's easy to complain about the "annualization" of video games—how companies like to milk a series cow for yearly sequels until the teat has run way too dry. But when it comes to Layton, I say bring it on: the professor's charming puzzle adventures just seem to get better and better every year. Because shooting down pirates, running into the forest, finding myself face to face with a giant tiger, getting the hell out of dodge, finding a hang-glider, and using it to soar across the skies to safety was one of my most enjoyable gaming experiences in 2012.